The commuter rail project for greater Nairobi has received the approval of the National Environmental Management Authority (NEMA) which has decided that the Sh24 billion-scheme will not have a negative impact on the environment. The major project involves the rehabilitation of approximately 160km of existing rail within the greater Nairobi area as well as the construction of stations and workshops. Central to the scheme – designed to ease congestion along several major roads in Nairobi – is the provision of a 6.5km direct rail link between Jomo Kenyatta International Airport (JKIA) and Embakasi in the city centre business district (CBD). The project also involves the rehabilitation of the Nairobi Central railway station and upgrading the existing railway lines serving Thika 40km north-east of Nairobi, and Limuru 50km north-west. New lines are to be built to serve Kiserian, Kiambu, Ruai and Kikuyu outside the capital. The project is being developed by a partnership of Kenya Railways and InfraCo Ltd, a private infrastructure development group funded by several EU donor agencies. 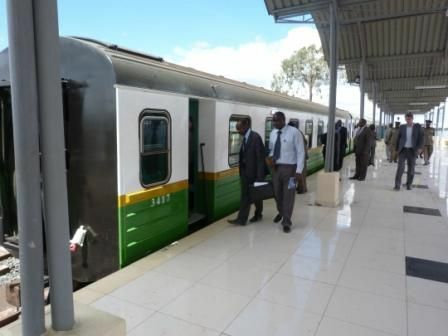 Last November the eastern suburb of Syokimau inaugurated the first railway station to be completed as part of the Nairobi commuter rail project. The modern station is equipped with electronic tickets and turnstiles.